Enjoy the Top 10 Prayers for your Health and Healing below. Read and Listen to Positive Prayers every day for 21 days and bring Biblical Prayers to your daily prayers. Learn to pray God's Word, and believe God's Promises! These Encouraging and Inspirational Prayers will help you to stay focused on God, and receive His many Blessings! Click any subject to the right for more Prayer Samples. I pray for total health and healing. I believe Your promise that You are the Lord that heals me. God, thank You that there is power for our health and healing. With You, I walk in power. I will wait on You LORD: and be of good courage, and I pray that You will strengthen my heart. With Your blessings Lord… our days shall be multiplied, and the years of our life shall be increased. My hope is in You God: for I shall yet praise You, who is the health of my countenance, and my God. Thank You for Your promise - with long life will You satisfy me, and show me Your salvation. Preserve me, O God: for in You do I put my trust. I trust all of Your promises for my health and healing. Lord, thank You for keeping me healthy and healed, and giving me life more abundantly. 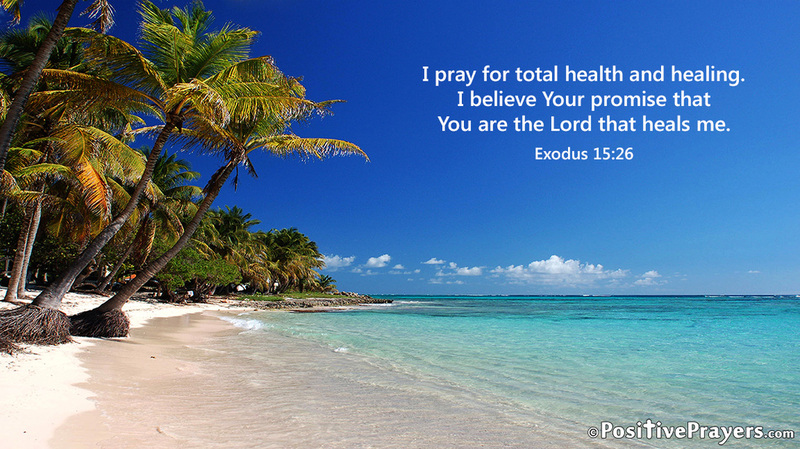 Enjoy the 52 Best Biblical Prayers for Your Health and Healing! Positive Prayers will help you Pray God's Word, and believe God's Promises! They are the most Encouraging and Inspirational Prayers. They will help you to stay thankful, and appreciate all of your blessings. Positive Prayers will help you live the abundant and blessed life! With God all things are possible! Praying God's Promises will fill you with FAITH and BELIEF. Jesus said, "All things are possible to those who believe." Listening to Positive Prayers daily will help you to add Biblical Prayers to your daily prayers. Learn to speak and pray God's Word! If you change your prayers, you can change your life! Click for the full 52 Positive Prayers for Health & Healing eBook.